Bring interactivity to any meeting room with our latest ultra-short-throw projector, featuring finger-touch and dual pen capability, a high brightness level of 4,400 lumens, Full HD WUXGA resolution and remote multi-location connectivity. The ultra-short-throw EB-1460Ui is designed to present a scalable screen size of up to 100 inches to deliver the requirements of any business working environment. This interactive meeting room solution combines the benefits of flipcharts, whiteboards and conventional screens into one unified meeting room solution. Meeting participants can view and annotate whiteboard content from a range of smart devices, without the need for any special application and this ensures information remains secure with the ability to apply passwords to meetings and notes. Use your fingers to annotate directly on the screen. 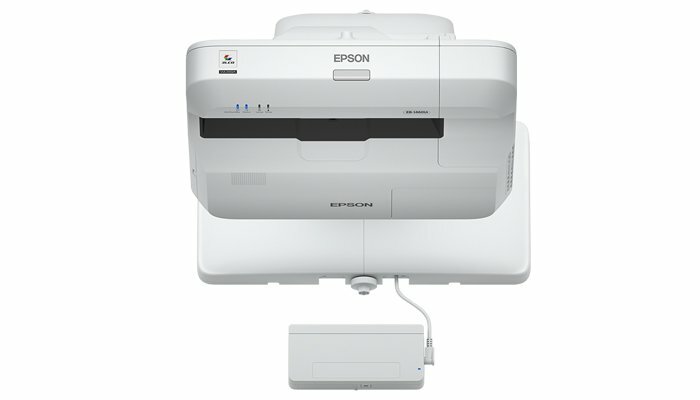 Epson’s interactive pens are now even more responsive and easy to use. With the new dual pens, colleagues can work simultaneously using different pen attributes. Share content easily from a range of smart devices using the iProjection App and screen mirroring feature. The same content can be annotated remotely, with up to four networked projection systems connected at the same time.